New Brighton was a favoured destination for Stonnall School excursions in the 1950s. 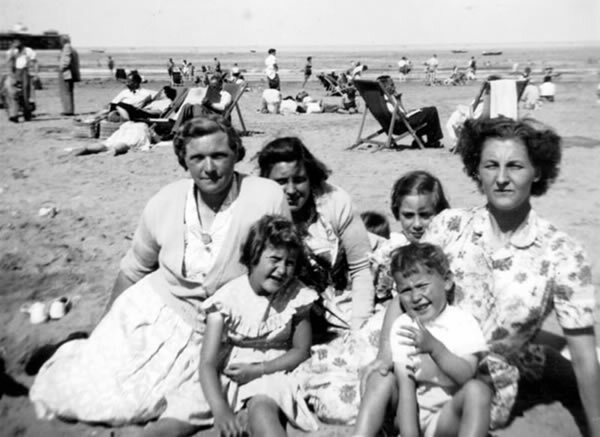 Here are some daytrippers on the beach at that resort in about 1955. From left, front: Pauline and Ray Blakemore. 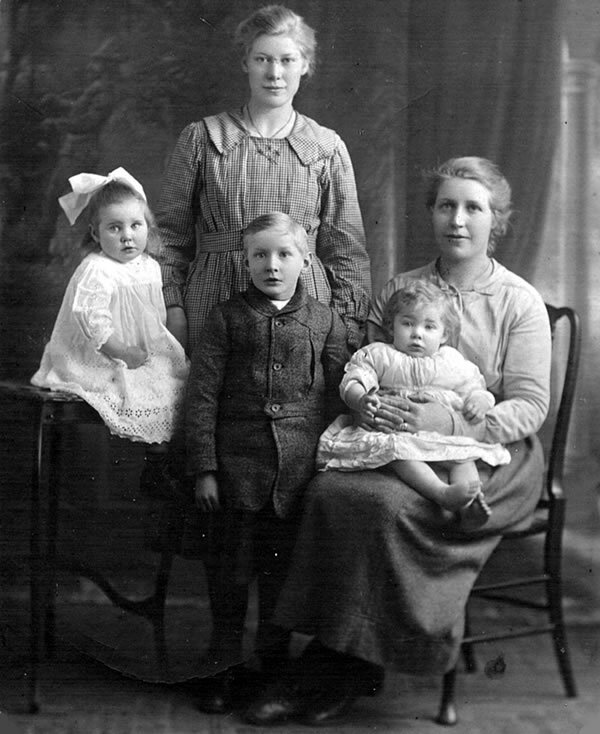 From left, back: Hilda Allerton (Hopley, shown below), Dora Clarke, Christine Castle, Nancy Castle (Broadhurst). Another daughter of William and Susannah Hopley (see posts below). This is Hilda who married one of the Allerton brothers. The other Allerton brother was the farmer at Thornes House for the last period in which it was still a working farm. Picture shared by Pauline Blakemore. 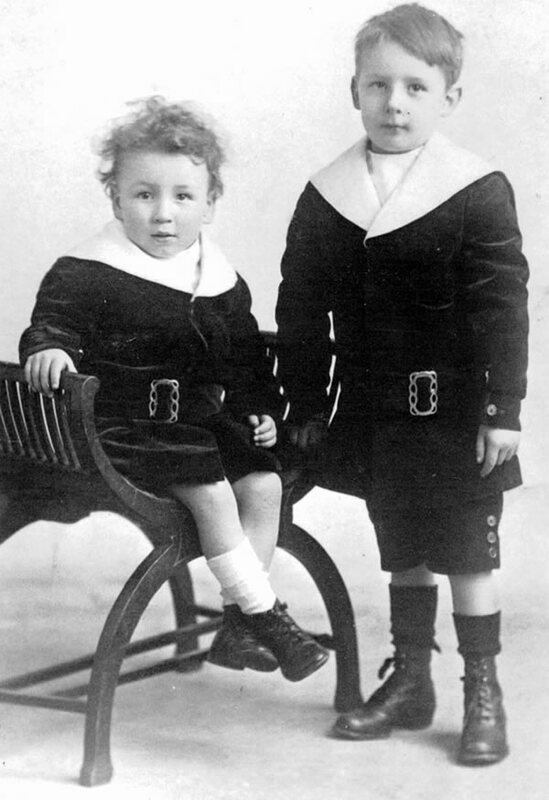 George (left) and David Blakemore, pictured about 1915. 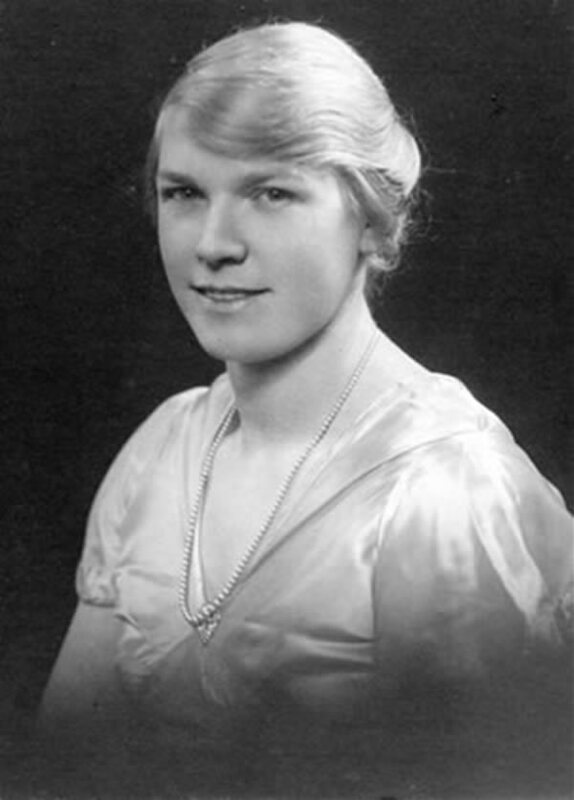 David would go on to marry Daisy Clark who is shown in the preceding photo. Both pictures shared by Pauline Blakemore. Sitting on the table, Daisy Clark; girl standing, Agnes Hopley, later Mrs Ensor of Cartersfield Lane; boy at front, Jack Hopley; girl sitting, Anne Hopley, later Mrs Clark; boy on lap, Alfred Clark. The photo would appear to have been taken around 1910. 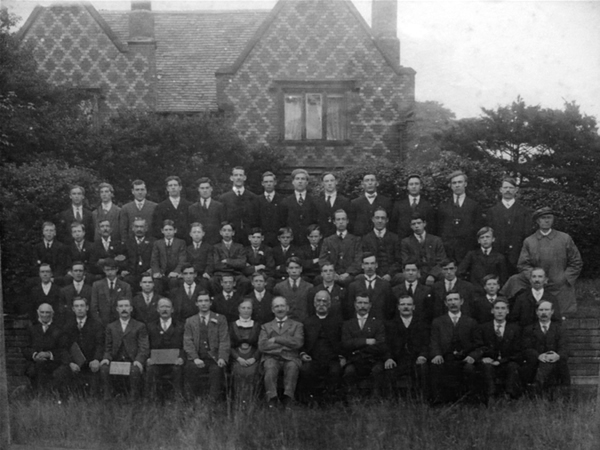 Stonnall history sleuth, Steve Hickman has come up with this photo of Rev Hutchinson and his bible class meeting in the back garden of the vicarage, dating from around 1910. The somewhat surprising style of the original brickwork of the house is clearly visible. Looking towards Thornes House from the playing fields. The 'Thunderstorm Lake' recreating itself today 27/11/12 in the Town Croft field next to Well Meadow (the playing fields). 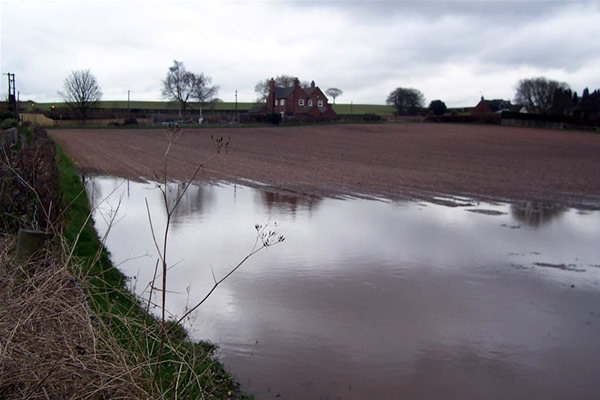 The story is that there was once a sizeable pool or lake at this location, but that it disappeared overnight during a thunderstorm some time in the 18th century. Quebb is an interesting bit of toponymy because it was brought to the area by some of the earliest Germanic migrants to arrive in this locality during the Dark Age period 410 - 650 AD. Many of these people were from Angeln in Denmark, but the people who coined the name Quebb were from Friesland. These mixed groups of migrants arrived at the Wash and then spread down Trent Valley, arriving in the West Midlands in a process that took 100 - 150 years. 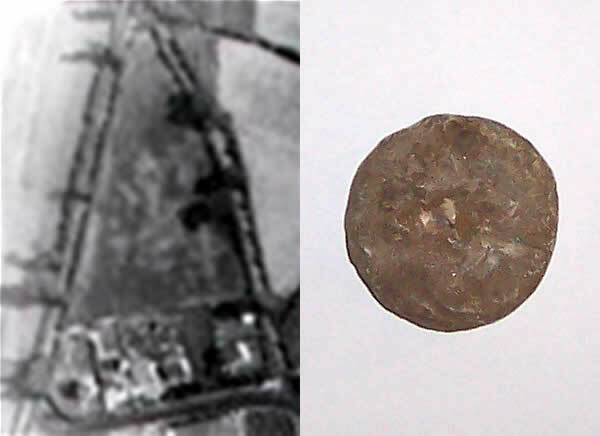 Above left, the 1963 aerial photo of the field formerly known as Chapel-yard Close and, right, the weight that was found during our recent investigation of that field. The troy system of weights existed between about 1400 and the early 1800s when it was replaced for most materials by the Imperial system. This firmly places the weight in the time frame of the chapel, which was closed as a result of the Reformation in the mid 1500s. It is possible to make further inferences: the location of the market presented the same advantages as those of the location of the chapel. 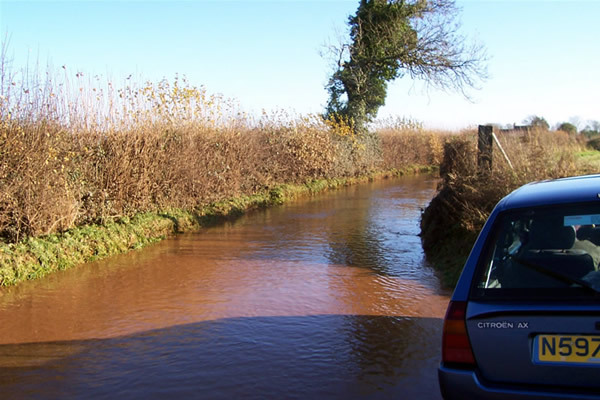 It was equidistant from Upper Stonnall, Lower Stonnall and Lynn. The market was close enough to the chapel to enable the minister to collect his tithes with ease. There will be a full write-up of the investigation in the near future.